Well, it's just more than 2 years ago since we departed for our Worldflight. Since then a lot has happened, but no major flight adventure. While the Worldflight was of course the ultimate flight adventure and cannot easily be topped in terms of distance or duration, there are other similarly interesting flight adventures to be had. 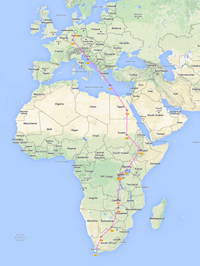 One such flight - and we have been wanting to do this for a long time - is the route from Germany to Cape Town. Well - the time has finally come and we are planning to depart from Hildesheim in our trusty Silver Eagle on 20th October, 2015. We expect to cover more than 12,000 kms and spend around 40 hours flying over a 2-week period. We are writing this entry on the Worldflight blog to reach all our devoted followers who registered their email on the blog at the time. You should now be receiving this blog entry and if you are interested, please feel free to register your email address on the new Africaflight blog as well. We are looking forward to the trip and please feel free to send comments.